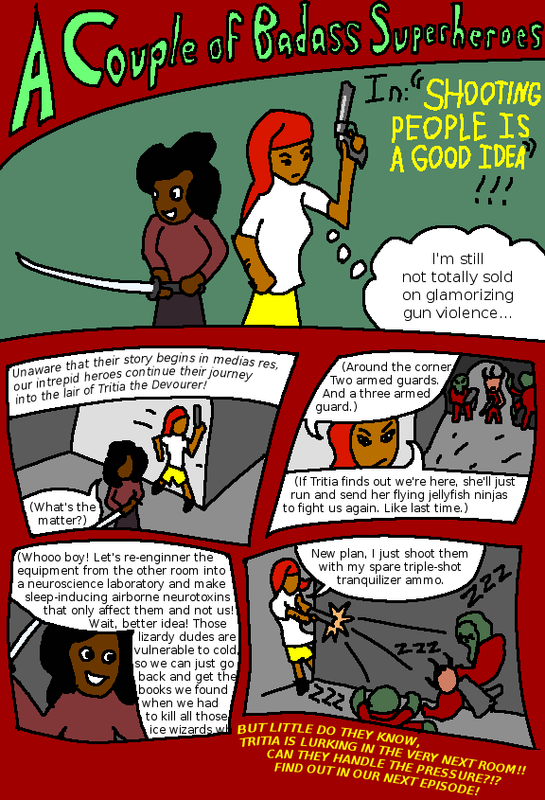 TITLE: A Couple of Badass Superheroes, In: "Shooting People Is A Good Idea"!!! Two superheroes stand around. On the left is Jeva, a grinning short person with big hair and a katana. On the right is Sam, a taller, more serious-looking person holding up a revolver. Both of them would probably read as female to most viewers. Jeva and Sam sneak along a corridor. NARRATION: Unaware that their story begins in medias res, our intrepid heroes continue their journey into the lair of Tritia the Devourer! SAM: Around the corner. Two armed guards. And a three armed guard. If Tritia finds out we're here, she'll just run and send her flying jellyfish ninjas to fight us again. Like last time. SAM: New plan, I just shoot them with my spare triple-shot tranquilizer ammo. Sam does that. The guards all fall asleep. NARRATION: BUT LITTLE DO THEY KNOW, TRITIA IS LURKING IN THE VERY NEXT ROOM!! CAN THEY HANDLE THE PRESSURE?!? FIND OUT IN OUR NEXT EPISODE! Without further ado, a comic! I don't know how long this is actually going to run; I was originally planning four pages, but I keep having new ideas! It's very easy to come up with new ideas for a story as ridiculous as A Couple of Badass Superheroes is shaping up to be. Of course, the other reason I'm writing it is that Jeva and Sam (if you didn't read the transcript, those are the heroes' names – Jeva is the one with the katana) are super awesome and badass, and if I don't draw this comic, I'll be the only one who can enjoy how awesome they are. Anyway! My schedule is pretty random right now, so I don't know when I'm going to write the next page, but I'm hoping it'll be within the week! Look forward to it!